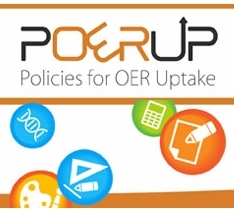 Earlier this month the Policies for OER Uptake Project (POERUP), drew to a conclusion and published its final reports and deliverables on the POERUP Referata. The overall aim of POERUP was to undertake research to understand how governments can stimulate the uptake of OER by policy means. Led by Sero Consulting and involving the Open Universiteit Nederland, Athabasca University, the University of Leicester, Université de Lorraine and EDEN, POERUP ran from 2011 – 2014. The project’s key deliverables include a final report, thirty-three country reports focusing on the national policy context relating to OER, a comprehensive list of open education initiatives with OER maps, policy advice for universities, colleges and schools and, policy proposals for eight EU countries, plus Canada. The Country Option Pack for Scotland (pdf) puts forward evidence based policy recommendations for higher education, colleges and schools, though many recommendations are applicable across all three sectors. The recommendations are directed at the Scottish Government and Government funded education agencies, rather than at individual institutions. Many of the policy recommendations put forward by Open Scotland are echoed by POERUP and the pack takes the Scottish Open Education Declaration as its starting point. The POERUP team suggest that a small amount of funding investment can go a long way to help create a culture in which open education can flourish, and they recommend that the Scottish Funding Council invests in open education by setting up an innovation fund to support new online initiatives in higher education, further education and the school sector with a commitment to opening up education. The report also focuses on the potential of developing more flexible approaches to measuring and accrediting knowledge and competences including workbased learning, flexible learning and accreditation of prior learning. The report highlights the potential importance of the College Development Network’s Re:Source OER repository in developing a national quality assurance standard for OER content produced in Scotland and urges the initiative to consider establishing and funding an OER evaluation and adoption panel. The POERUP report represents a valuable step forward in promoting the development and uptake of policies to support open education in Scotland and it is to be hoped that the Government agencies towards whom it is addressed will take note and act on these recommendations. This entry was posted in cetis, oer, openscot, policy and tagged cetis, further education, higher education, oer, openscot, poerup, policy. Bookmark the permalink.